What a lovely way to end the month – we’ve just had a fantastic weekend at Miss Ivy’s Revival at Cockington. We met lots of lovely people and had fun and games galore. We’ve got an array of super, summer events coming up in June which we’re sure you’ll enjoy and, even better, they’re raising money for us.We hope you’ll all be able to get along to one or two and we look forward to seeing you there. The month was started in pretty energetic style by Luke who took part in the epic Thames Path 100 race. 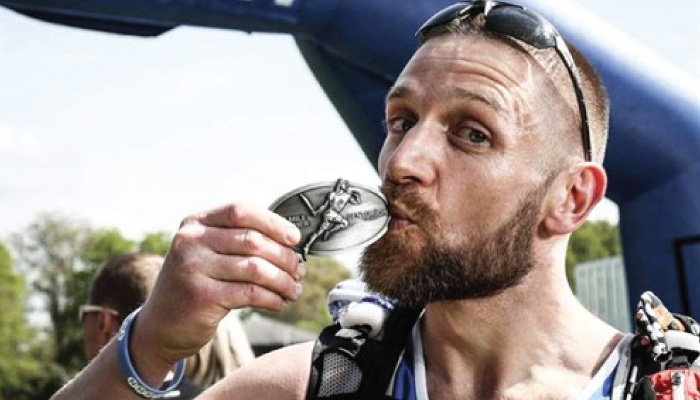 In a mere 25 hours and 22 minutes Luke ran from London to Oxford along the Thames path. Wow. Huge thanks must go to Centurion Running for organising the event. The excellent crew who supported Luke on his run included Luke’s mum and dad, Helen and John Tillen, Jane and Arthur Christian and Anne and Pete Prior. Luke says he would have been lost without Matthew Day and Stephen Lofthouse of Torbay Athletics Club who took it in turns to pace him throughout the race. And, of course, a very big thank you to everyone who sponsored Luke. Who remembers Super Saturday at the London 2012 Olympics? Medals, cheering, spectacular achievements – you know how it went. Well, one Sunday in May we had a pretty Super day ourselves. How about this…..
Our fabulous Riviera to Riviera cyclists, Mark Mallen and Chris Halls, arrived in Nice completing their 700 mile cycle. Yasemin Keskin crossed the finishing line of her amazing 100km walk from London to Brighton. Our fab friends at Winners 2000 held a football tournament to raise funds for us. As if all that wasn’t super enough, a team of runners ran a coastal half marathon well and truly flying the THHN flag. A Super Sunday indeed we think you’ll agree. The Torbay Half Marathon takes place on Sunday 29 June, starting on Paignton Esplanade. Team THHN will be there, running, cheering, helping out and generally enjoying themselves. Fancy taking part? There are places in the half marathon itself or why not think about taking part in the Fun Run, ideal for all the family? Same date, starting at 9am it’s a lap of Paignton Green which is just over a mile. There’s a spectacular evening planned at Hennessey’s restaurant in Torquay on Friday 13 June, all to raise money for us. There’s live entertainment all evening from acts including Anais Hay, Hannah Williams, live band and DJ Badja. There will be a casino table, close hand magic, delicious canapés and nibbles and an auction of fantastic lots. Tickets to come along and enjoy all that the evening has to offer, with your welcome glass of Prosecco in your hand, are just £20 per person and the dress code is black tie and ball gowns. For more information ask at the restaurant or call Emily on 07712 443477. We are also looking for volunteers and businesses to sell our amazing raffle tickets, they are just £1 each, with a top prize of £500 and a weekend break in London’s 4* Cavendish Hotel, including train tickets! 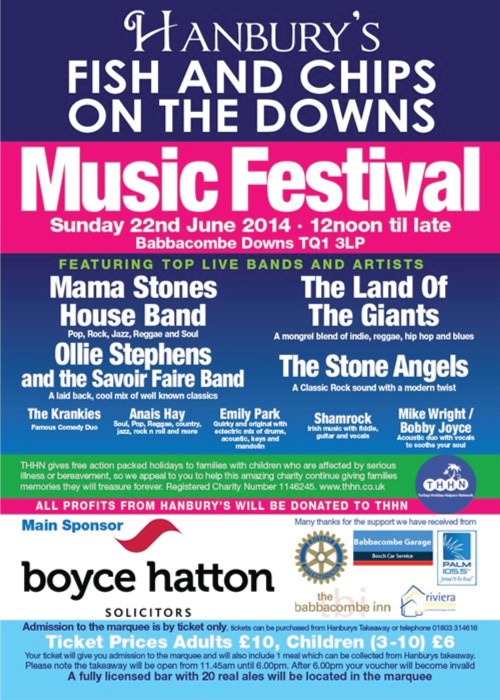 The draw will be made on the 22nd June at the Hunbury’s Music Festival. Claire’s Cakes, Riverford Home Delivery South Hams, D&H Fisheries, Save on Meats Torquay, Total Produce Devon, Teddy’s Cakes, Halletts the Bakers and Over the Rainbow Cake Design for the array of goodies they all so generously give our holidaymakers. Vomero Holiday Apartments in Torquay who gave a holiday to a family referred by the CLIC Sargent team at the Royal Marsden Hospital in London. The Level 3 Business Studies students at South Devon College who raised £288.23 for us with various activities including filling a car with balloons and asking people to pay to guess how many were in there. Where do all these ideas come from?! Hotel De La Mer who welcomed a family referred by the Rainbow Trust Children’s Charity. Pro Performance Torbay who are running a pounds for pounds fundraising scheme. They are encouraging people to go and be weighed and then be sponsored for every pound that they lose until the end of July. If you want to find out more pop in to their shop at 300A Torquay Road, Paignton. All Saints Primary School who had a fun mufti day to raise funds for us. Buckfast Abbey who welcomed a family referred by the Plymouth CLIC Sargent team into their self-catering holiday home. The Marine Hotel who gave a holiday to a family referred by Shooting Starchase Children’s Hospice. The Torbay Cornish Association who had THHN Trustee and Director, Martin Brook, as their lunchtime speaker and who donated £150. Miss Ivy for inviting us to be part of their incredible Cockington Revival weekend, we really cannot thank them enough! A big thank you too, to Kathy Fox, vintage make up artist, who donated half of her takings at Cockington on Saturday at the Miss Ivy’s Revival event. May saw us provide our 400th holiday. Thank you to all of you who help us in any way at all. As we fast approach the fifth anniversary of the THHN and look back on the past five years we are constantly amazed at what’s been achieved by so many people working together.